My last name is derived from this area of Norway. 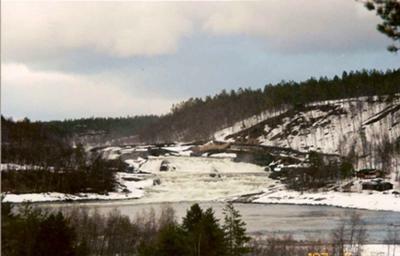 Foshaug – Fos meaning waterfall and haug meaning hill. My Great-great-great grandfather moved from southern Norway to the Malselv valley in the early 1800’s and built a homestead on the hill northwest of the [Malselv waterfall] – hence the name derivation. I traveled to this area in 1997 and toured the entire area on both sides of the falls and was thoroughly caught up by the atmosphere that my fore fathers must have felt. My cousin once worked as a commercial fisherman on the river and told me stories of the numerous large salmon that the would catch in the lake area at the base of the falls. I too, as mentioned in the above story, got the impression that this is more of a large area of rapids in the river rather than a waterfall.